Seems odd that after all these years of photo classes and my use of "toy" cameras that I haven't ever used a pinhole. Not that I didn't want to, it just seemed so limiting since you basically need a darkroom nearby. Now, I'm talking the box (or paint can) with a pinhole and a piece of photo paper in the back. That nice big paper negative. Well, I was lucky enough to sign-up for the last spot in a pinhole workshop at Gari Melchers home in Fredericksburg, VA. It was taught by Steve Griffin, a professor of Art at UMW and pinhole photographer. His favorite subjects include the beach scenes of Colonial Beach, VA. This is quite convenient since his studio (including traditional darkroom) is just blocks from the water. Anyway, he set up this make shift darkroom a kitchen and 11 of us walked around the grounds with our pinhole paint cans that Steve provided. It was an amazing experience! I am even more motivated to build my own and get the darkroom in my basement back to work. Here is my favorite catch of the day. 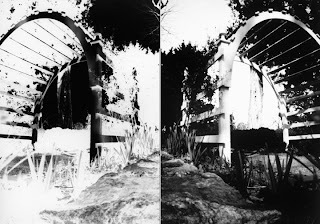 I scanned the paper negative and positive and combined them as a diptych. Want more information on pinhole photography? Check out the Pinhole Resource and Eric Renner's book "Pinhole Photography". 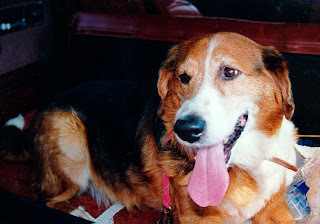 "Here is the story of how Rusty came into my life... As the volunteer photographer at Friends of Homeless Animals in Northern VA, I would go to each dog run to find the new dogs that needed their pictures taken for the web site. While passing this particular overweight beagle mix with the name "Money", I was compelled to stop. I looked at him, he looked at me, and I said, "Ok, I'll go get a leash." And that is exactly what I did. Asking the FOHA staff about his past, I found out that he was at a yard sale with a sign around his neck saying, "take me or I'm going to the pound." Some good samaritan had taken him and brought him to FOHA. I had already adopted Dinah a year before, so I was not looking for another dog. But, he insisted that I walk him and spend the entire day with him in my Jeep. I left him at the shelter that Saturday, knowing I'd see him again the next weekend. I could not get him out of my thoughts. So, I decided that if he was not adopted that next weekend, he would come home with me. When I showed up that next Saturday, I was told that an application had been approved and he was one of the dogs the family was interested in. When I took him out of his run that morning and brought him over to my Jeep for treats, he immediately jumped in and again made himself at home. The family that came to see him wanted an immediate "bond" with the dog they were taking home. Well, seems "Money" had already bonded with whom he wanted because he completely ignored the family and they ended up adopting another dog that "bonded" more quickly. So, "Money" and I went back to the Jeep, he jumped in and I filled out the adoption papers. That was July 1, 2000." Well, I judged the Northern District of GFWC photography show today (see earlier post). Was a nice experience. Saw some wonderful stuff there. Funny thing about it is that I was there with 2 other artists from the Fredericksburg, VA area that I was acquainted with. Elizabeth Seaver is truly a multi-talented artist. Starting off as a b&w photographer, she finds herself now painting, using mixed media, and block printing. She has stunning stuff. Deb Booth is predominantly a watercolor artist, but she seems to excel and most anything she attempts. I first saw her work during Pawsitively Fredericksburg exhibit where she airbrushed this amazing cat for charity. Check out their sites, tell them I sent you! 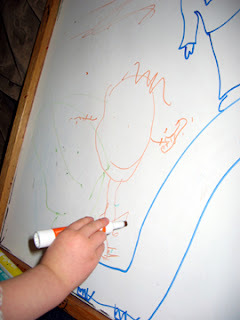 My 3 year old daughter drew her first self portrait (in orange dry erase marker) complete with toes & fingers! Gotta love it! She's an artist in training. Yes, I am still working on back issues of LensWork. And in the same issue as Radek Skrivanek (Sep-Oct 2005), is Frances Billes. This is a woman after my own heart. Her portfolios consist of hauntingly beautiful black and white images from abandoned structures or homes still occupied by family and all the physical memories that remain. One image in particular, "Aloha, LA - Doors" from her Transitions portfolio is a view consisting of many doors and doorways. This gives you the feeling of passing, through death or simply through growing up and leaving home. It is one that could capture me for some time. Luckily, many of the places she photographs are ones that she can visit over and over with new ways of seeing. Go check out her website. You will not be disappointed! While reading the Sep-Oct 2005 issue of LensWork, I discovered photographer Radek Skrivanek. He was born and raised in the Czech Republic, but immigrated to the US in 1989. He received his degree from Tufts University in 1996 and is now teaching photography in San Francisco. The images I viewed in LensWork are from his Aral Sea portfolio. The Aral Sea has lost more than half its size and 2/3 of its volume due to redirection of water for irrigation purposes. The toning of the images cause make the viewer feel the loss of this very important body of water to the people of the region. His use of the large format allows the viewer to see details that would otherwise be lost in a smaller format. I am particularly moved by the images of the stranded ships, with no water in sight. First you need to know that while I love art, I don't really like the mess a 3 year old can make with art supplies... So, I have a HUGE plastic box full of paint, oil crayons, chalk, glitter, stamps, sponges, paint brushes, salad spinner, you name it. It is our summer activity... painting. I mean the kind of painting that makes our paved driveway have paint spots from last summer. Well, yesterday Alexis and I broke out all those supplies and painted... canvases, wood, packing foam from a computer box, and SNOW!! Yep, we still had little piles of snow on the north side of the house and half a snowman. So, we painted them. No, not with the snowman spray kits you can buy, but with craft acrylic & paint brushes, Pollock style! What fun.... Now, here is the "Proud Mama" part. I was off doing "real" art (yeah, right! ), and looked over at Alexis and she is painting with a branch of pine needles!!! It's funny how you would normally be proud of your kids reading or counting, but I'm proud because my girl is painting with pine needles!!! I just hope to keep this experimental state alive as long as I can. Because one day, it will be "wrong" to paint with pine needles. Ah, she is such an inspiration to my creativity!